It may surprise you to realize, but Brian and I didn’t actually invent the genre of space fantasy. No, actually, there may not be a lot out there now, but science fantasy has definitely been around since the pulp magazines of the early 20th century. Lately we’ve both been reading the Barsoom series by Edgar Rice Burroughs (yeah, the guy who wrote Tarzan!). Burroughs wrote the stories serially between 1912 and 1943 (he died in 1950 at age 74). They were later collected into novels, and eventually rolled into public domain- nowadays you can totally download the ebooks for free from any of a number of sites. I find the books totally charming on a number of levels- they reflect that early-twentieth-century notion of Mars as a dying world, its seas dried up and its people hardy warriors with a strong sense of honor and nobility. Resources are limited, struggle and warfare is almost constant, and overall it’s just a great landscape for heroic adventure. 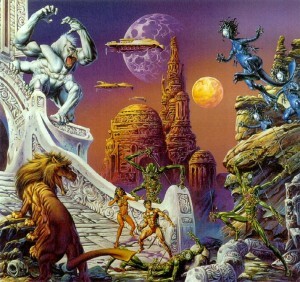 John Jusko painting of the Barsoom cast of characters. John Carter and Dejah Thoris in the middle there. Beautiful romantic dying Mars! Those esteemed literary scholars over at Wikipedia label the Barsoom series as “sword and planet”, which honestly is a good description. It’s set on Mars, and they use laser pistols and flyers and such, but they also fight with swords and lances and ride massive brutal mounts called thoats. There’s no -and-sorcery attached to that sword, though all Martians are telepathic, and later on in the series a few more weird abilities come to light. And the plots tend to follow the same formulaic fantasy plots of hero meets heroine, love love love, heroine is captured by villain, hero battles villain, hero and heroine get together. Beautiful 1976-era Boris Vallejo version of John Carter and Dejah Thoris. Damn, he so manly. Anyways, yes, it’s a really unique universe, with many gripping adventures, and each of them is a quick read. I am pretty sure that if John Carter was in the Astroarcane Universe, he would use his rocket boots inappropriately. And that Gahan of Gathol (Chessmen of Mars) would totally duke it out in a wizard duel. So hey, check Barsoom out, and let us know what you think!